The CFL on TSN is TSN's presentation of the Canadian Football League. TSN has broadcast CFL games since the 1987 season and has been the exclusive broadcaster of all CFL games (including the playoffs and Grey Cup) since 2008. While the CFL on TSN shows all CFL games, the game of the week is aired on Wendy's Friday Night Football. An additional, more entertainment-focused Thursday Night Football telecast (unrelated to the National Football League package of the same name, which airs on rival Sportsnet) was added in 2015. The CFL on TSN's studio panel consists of host Rod Smith and former CFL players Chris Schultz, Jock Climie, Matt Dunigan, and Milt Stegall with Doug Brown filling in occasionally. Former CFL on CBC studio host Brian Williams occasionally contributes to the studio show also. Smith took over host duties from Dave Randorf on June 23, 2014 after Randorf joined Rogers Media on June 2, 2014 as a play-by-play commentator for the company's National Hockey League television coverage. Chris Schultz returned for his eighth year of CFL telecasts on TSN. To go along with his extensive broadcast experience, he has 20 years of playing experience, including his days in the CFL and NFL. Jock Climie joined the CFL panel in 2002. The 12-year CFL veteran slotback is a three-time divisional All-Star and retired after the 2001 season with 56 touchdowns and 627 receptions. In the off-season, Climie works as a lawyer in Ottawa. Matt Dunigan returned to the CFL on TSN studio show after spending the 2004 season on the sidelines as the general manager and head coach of the Calgary Stampeders. Dunigan's in-depth knowledge, outgoing personality and passion for the game have made him a fan favourite with viewers. Milt Stegall joined TSN as a guest analyst in 2009 after a 14-year playing career in the CFL. Veteran sportscaster Chris Cuthbert joined TSN after leaving the CBC to become the primary voice of the CFL on TSN, paired with longtime colour commentator Glen Suitor. Sara Orlesky has been the lead sideline reporter for Friday Night Football since 2008. The secondary commentating team is Rod Black and Duane Forde. Gord Miller and Dunigan work as the third team, when needed. ESPN3, the online arm of ESPN Inc., has carried most CFL games since the 2008 season. 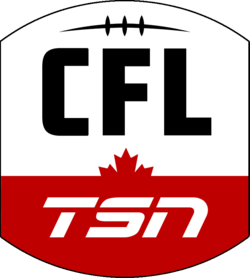 As part of the 2013 contract extension, which included both U.S. and Canadian broadcast rights, ESPN's terrestrial networks (particularly ESPN2) have carried TSN's coverage of the CFL on U.S. television. In the early 1990s, Prime Network simulcast TSN's coverage. In 2008, Friday night games were shown on the World Sport channel of Voom HD. However, in January 2009, Cablevision shut down Voom HD. America One held the rights to other TSN and (prior to 2008) CBC simulcasts through the 2009 season; America One syndicated its games to various regional sports networks across the United States. After that agreement ended, the CFL secured one-year limited broadcast deals with NFL Network (2010–11) and NBC Sports Network (2012-13).